Spectacle Learning Media is a small, family owned partnership licensed in New Hampshire, USA. Since 2001, we have worked with publishing companies, international organizations, and government initiatives to help create accessible and engaging learning media, from interactive computer software for newly arrived immigrants and refugees to early grade reading materials for children struggling to get to learn in some of the world's poorest and most dangerous places. Wherever we go, we seek to build upon local knowledge and expertise to find local, sustainable media solutions that both inspire and enable learning throughout life. MENTORING IN THOUGHT AND ACTION Master Trainers' Workshop. Dr. Jean Bernard begain her teaching career as a Peace Corps Volunteer in Chiengkaan, Thailand in 1967. Since then, she has taught and produced materials for learning in Viet Nam, Kuwait, Saudi Arabia, Lebanon, the United Arab Emirates and the United States. She has also worked as an instructional designer and curriculum specialist at Bunker Hill Community College in Boston and from 2004-2009 held the post of Senior Programme Specialist in textbook development at UNESCO Headquarters in Paris. Jean has worked full time at Spectacle Learning Media since 2009, and has led projects in Tajikistan, Somalia and South Sudan. She holds a doctorate in education (Ed.D.) from the University of Massachusetts at Amherst. As lead videographer and art director for Spectacle Learning Media, Dr. Michael Johnston brings a lifetime of experience in designing and illustrating educational media for print and electronic environments. His doctoral research at the University of Massachusetts focused on educational video production working with a multilingual, multicultural community. He has taught video production at Dubai Women's College and trained researchers at Sénoufo Cultural Research Centre in Burkina Faso. 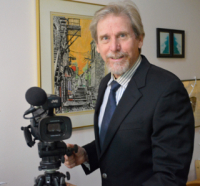 In addition to his work with SLM, Michael teaches video production at Nackey S. Loeb School of Communication in Manchester, New Hampshire.